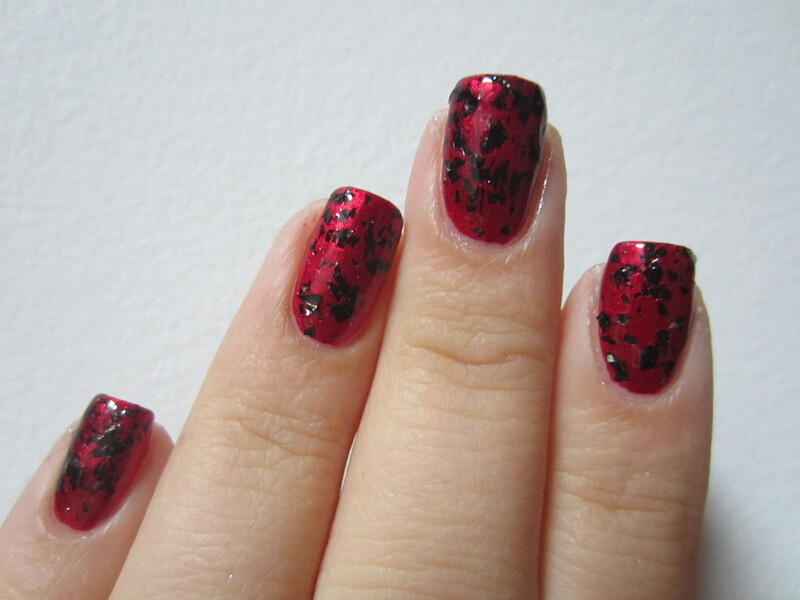 If you guys have been following me for a while, then you know that I have an affinity for black and red nails. Its a nod back to the time in my life that I thought I was really punk rock. I fondly remember a time not so long ago when I use to think guys who had black nail polish and eye liner were hot as hell and I proudly donned lime green glitter eye shadow and purple hair. Every fall I trade in my flip flops for converse, tank tops for flannel button downs,and country music for all my favorite bands from high school. Since the weather is getting colder and the Misfits have once again entered my iPod playlists, I figured I would try out another new edition to my polish collection. Icing “Shredded” is a black flake polish in a clear base. A black flakie? I have never seen a black flakie polish. 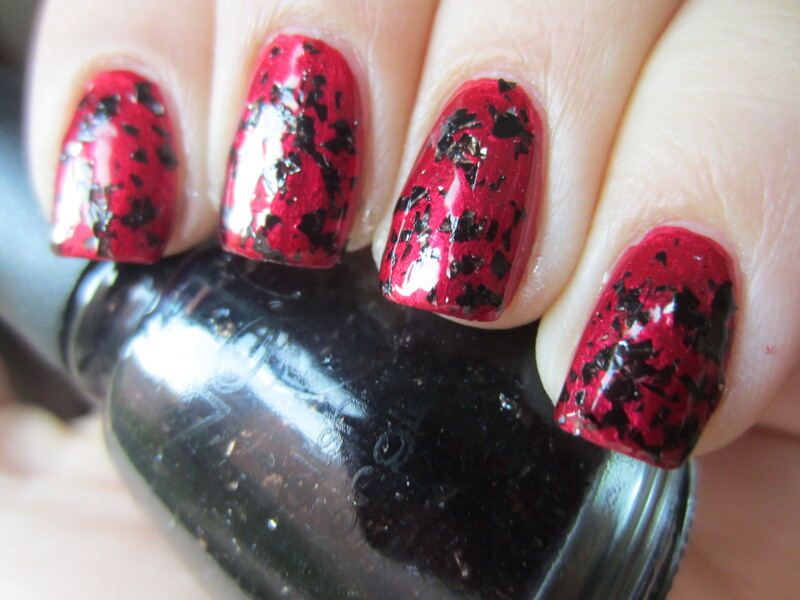 This polish was definitely appropriately named because it does look like my nails have a shredded effect. Icing always impresses me with their polishes because they seem to take whatever trend is going on in the nail polish world and twist it into something fun. This polish is no exception! Not only are their black flakes in this polish but there are some silver glitters. The silver totally threw me off because I didn’t see it in the bottle. The formula on this polish was ok. This is 1 coat over Butter London “Knees Up” and the flakes were nice and dense. But sometimes the flakes would cluster up together and I had to do some maneuvering to get them to separate. Also, like the other Icing flakie polishes I have, the pieces do not lay flat. No matter how how many layers of top coat I use, my nails are still sharp with pieces of the flakes jutting up. I found the only way to combat that is if I use my finger and gently press down while the Icing polish is still wet. The dry time was a little longer than normal but not so long to be a problem. What do you guys think of this polish? Icing always has sales on their polishes, buy one get one half off, and since the polishes are $4.50, its a great deal.